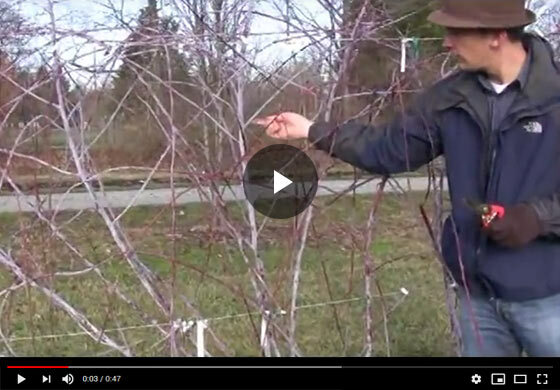 Felix, gurney's resident horticulture specialist shares some tips on how to prune black raspberry plants early in season. You'll learn how to identify the fruiting buds, which canes to cut, which ones to leave intact for maximum output. Hi everyone, Felix here at Gurney's and today we're at our research farm in late winter, and I want to talk to you about raspberries. These are black raspberry, one of my favorite tan fruits, and these are growing very well for us. We basically have put our flora canes. This is a second-year cane, so these canes that grew last year, down here, and they've gone dormant and they're going to bear all of our fruit this year. So those are last year's canes we've trained onto some wires so they get some nice vertical support and get real tall, and then we've got nice branching here that have come off those canes. We have some lateral growth, some real nice development. One of the points with black raspberries is every when you're treating them right, they really want to grow and there's been a lot of growth on these plants. We've tipped them a couple of times, which we'll show you in some other videos how to do that with your first year canes but after the winter, some of this late season growth here, it's small caliper. It was growing very late so there's not a lot of carbohydrate reserves in these shoots and they won't really make it in the winter. And you can see here we have some tip die back, this is dead tissue and that's not going to do much for us. Even here where it's alive, we have that nice form in some green tissue. It's just not, there's not a lot there to support a fruit crop, so you're pruning with black raspberries, really is to take back all that late season growth at this point in this season, which is late winter. And what my general rule of thumb is, is you want to imagine a load of fruit and what this particular cane can support, and if you'll look here, how to identify your fruiting buds, we've got a couple here. They're a little hard to tell this time of year, but that's a fruiting there. It's right behind where that leaf was attached last year. So those are going to initiate some growth and at the tip of that growth is going to be your flower and fruiting cluster. That's what's going to be your fruit for this season, very important to note that, because that's what's in consideration when you do the pruning. So each of these nodes is capable of producing and when it gets enough light, it's producing a cluster of wonderful black raspberries, really great to eat. So what we're going to do is take this back to where we think that, you know here we have about eight clusters back to here that are going to form, and so I'm taking it back to about, right there, and this is going to be able to support that weight and that's really the consideration. The other thing is that the caliper is about pencil thickness which is ideal for this supporting of fruit, and that's why we're taking this whole cane back. All this late season growth is going to be trimmed back to that kind of material. Alright, so here we have a couple of canes that are late season shoots coming out of the ground that really, they're just too low for any fruit production. They're not doing us any good so we're going to trim those out. We also have a little bit of stunt material that's left from last year's fruiting canes, doesn't really need to be there so those are going to come out as well. Just going to trim them back a little bit. So these are just remnants from last year, and these young little shoots here, they're just going to get shaded out. They're not, again, thick enough caliper to really support much so they're coming out around our crown. The key here around the base of the plant is that you want, we have the ideal number of crowns here, you know, six-seven crowns that are coming up and we can spread them nicely so they get good sun exposure and that's ideal around the crown as far as how many shoots you have coming up. So basically, here we've finished up most of the pruning as I've described. There are a couple last little pieces here, we have some stub cuts that were made late season last year. We have a little bit of winter entry which you can see here and in the changed coloration and I want to trip that back to something that's healthy. So I'm going to cut it back to about here where there's some nice growth and there are a couple of points where that can be done, and some here that's a little bit compromised from the winter. You're going to have that every year with your black raspberry here, we're in zone 5, just, you're going to have a little bit of that winter kill and the plant here is very healthy and ready to produce a lot of fruit this season. So join us for the next black raspberry video where we talk a little bit about harvesting, keeping the buds off your fruit and you'll be able to see if how wonderful this thing performs for you later in the season. Thanks very much.